Colin Carr appears throughout the world as a soloist, chamber musician, recording artist, and teacher. He has played with major orchestras worldwide, including the Royal Concertgebouw Orchestra, The Philharmonia, Royal Philharmonic, BBC Symphony, the orchestras of Chicago, Los Angeles, Washington, Philadelphia, Montréal and all the major orchestras of Australia and New Zealand. Conductors with whom he has worked include Rattle, Gergiev, Dutoit, Elder, Skrowasczewski and Marriner. He has been a regular guest at the BBC Proms and has toured Australia and New Zealand frequently. As a member of the Golub-Kaplan-Carr Trio, he recorded and toured extensively for 20 years. Chamber music plays an important role in his musical life. He is a frequent visitor to international chamber music festivals and has appeared often as a guest with the Guarneri and Emerson String Quartets and with New York’s Chamber Music Society of Lincoln Center. Colin is the winner of many prestigious international awards, including First Prize in the Naumburg Competition, the Gregor Piatigorsky Memorial Award, Second Prize in the Rostropovich International Cello Competition and also winner of the Young Concert Artists competition. Colin studied at the Yehudi Menuhin School with Maurice Gendron and William Pleeth. 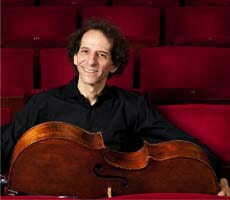 He has held teaching positions at the New England Conservatory and the Royal Academy of Music. St John’s College, Oxford created the post of “Musician in Residence” for him. Since 2002 he been a professor at Stony Brook University in New York. He plays a Matteo Gofriller cello made in 1730.